U.S. President Donald Trump continued a 70-year-old White House Thanksgiving tradition by pardoning the National Thanksgiving Turkey in a ceremony in the Rose Garden on Tuesday. 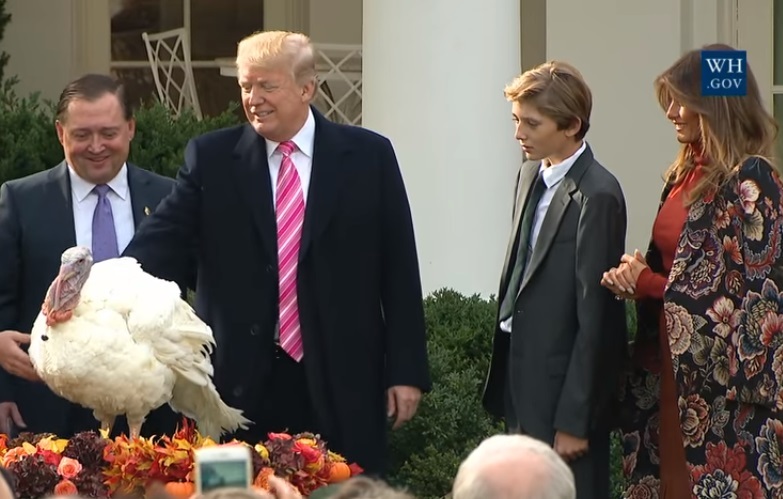 The two turkeys chosen for the Presidential pardon are named Drumstick and Wishbone. "It was 70 years ago that the National Turkey Federation first presented the National Thanksgiving Turkey to President Harry Truman -- who, I might add, did not grant the pardon. He refused. He was a tough cookie." President Trump joked. "Today, I'm going to be a much nicer President." Following the pardon, Drumstick and Wishbone will live out their days at “Gobbler’s Rest” which is a custom-built enclosure on the campus of Virginia Tech. There, they'll join Tater and Tot, the two turkeys pardoned last year by President Obama. "As many of you know, I have been very active in overturning a number of executive actions by my predecessor. However, I have been informed by the White House Counsel’s Office that Tater and Tot’s pardons cannot, under any circumstances, be revoked," said Trump. "So we're not going to revoke them. So, Tater and Tot, you can rest easy."